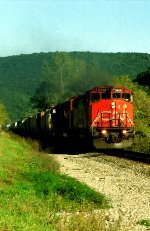 Description: CN SD50F 5417 assists train 148 in to the GTW Tunnel yard, Winter 2005. Description: Hear, we see a line up of CN, GTW, and CSX power at the west end of the GTW's Tunnel Yard(known as Tappan). Description: The giveaway for Q 626 was the Canadian power. Here CN 5147 leads the train toward Syracuse. Description: A westbound CN Freight train rounds the curve east of Durand Union Station. Taken on the way to Owosso. Description: Another awesome consist on CN 392. Description: An SD50F/AC44W combo roll towards Northtown with the second transfer, clearing the snow from the rails. Description: Something that isnt common anymore with CNs Power Utilization, a unit in the spur. A welcome site! Description: After coming out of Humboldt, the WC starts to make its way back up to New Brighton. Description: The WC comes out of Humboldt and starts to climb up the hill with a good sized train out of Humboldt.